A hair conditioning composition comprising silicone polymer containing quaternary groups and a gel matrix. The composition of the present invention can provide improved conditioning benefits such as smooth feel and reduced friction to both damaged hair and non-damaged hair, while providing other benefits such as slippery and slick feel on wet hair. This application claims the benefits of U.S. Provisional Patent Application No. 60/691,175, filed Jun. 16, 2005. The present invention relates to a hair conditioning composition comprising silicone polymers containing quaternary groups and a gel matrix. The composition of the present invention can provide improved conditioning benefits such as smooth feel and reduced friction to both damaged hair and non-damaged hair, while providing other benefits such as slippery and slick feel on wet hair. Shampooing cleans the hair by removing excess soil and sebum. However, shampooing can leave the hair in a wet, tangled, and generally unmanageable state. Once the hair dries, it is often left in a dry, rough, lusterless, or frizzy condition due to removal of the hair's natural oils and other natural conditioning and moisturizing components. The hair can further be left with increased levels of static upon drying, which can interfere with combing and result in a condition commonly referred to as “fly-away hair,” or contribute to an undesirable phenomena of “split ends,” particularly for long hair. A variety of approaches have been developed to condition the hair. A common method of providing conditioning benefit to the hair is through the use of hair conditioning agents such as cationic surfactants and polymers, high melting point fatty compounds, low melting point oils, and silicone compounds. Most of these conditioning agents are known to provide conditioning benefits by depositing on the hair. Human hair becomes damaged due to, for example, shampooing, combing, permanent waves, and/or coloring the hair. Such damaged hair is often left hydrophilic and/or in a rough condition especially when the hair dries, compared to non-damaged or less damaged hair. There is a need for hair conditioning compositions which provide improved conditioning benefits such as smooth feel and reduced friction on dry hair, especially on damaged hair. Based on the foregoing, there remains a desire for hair conditioning compositions which provide improved conditioning benefits such as smooth feel and reduced friction on dry hair, especially on damaged hair. There also exists a desire for hair conditioning compositions which provide the above conditioning benefits, while providing other conditioning benefits such as slippery feel and slick feel on wet hair. The present invention provides improved hair conditioning compositions. In accordance with one of the preferred embodiments, there has now been provided a conditioning composition comprising a silicone polymer containing quaternary groups, and a gel matrix. The silicone polymer comprises silicone blocks with greater than about 200 siloxane units. And the gel matrix comprises a cationic surfactant, a high melting point fatty compound, and an aqueous carrier. Another preferred embodiment includes the composition above combined with at least one additional silicone-based component selected from the group consisting of silicone emulsions, amino silicones, silicone copolyols, and silicone-based quaternary ammonium compounds. The present invention also provides novel intermediates that are useful for employment in hair compositions. One exemplary intermediate comprises a first polymer comprising silicone and a second polymer comprising a silicone, wherein the resulting combination of the two polymers have a tan δ value of from about 0.01 to about 5. The present invention further provides unique merchandising systems. The merchandising systems include a hair conditioning composition as provided herein, and a means for communicating a benefit from using the composition. In accordance with one of the preferred embodiments, there has now been provided a merchandising system comprising one of the hair conditioning compositions set forth above; and at least one of packaging for the hair conditioner and marketing material pertaining to the hair conditioner comprising indicia and/or an image providing a communication to consumer related to hair breakage, hair fall out or hair shed, and/or hair strength. The essential components of the personal care composition are described below. Also included is a nonexclusive description of various optional and preferred components useful in embodiments of the present invention. While the specification concludes with claims that particularly point out and distinctly claim the invention, it is believed the present invention will be better understood from the following description. All percentages, parts, and ratios are based upon the total weight of the compositions of the present invention, unless otherwise specified. All such weights as they pertain to listed ingredients are based on the active level and, therefore, do not include solvents or by-products that may be included in commercially available materials, unless otherwise specified. The term “weight percent” may be denoted as “wt.%” herein. The compositions and methods/processes of the present invention can comprise, consist of, and consist essentially of the essential elements and limitations of the invention described herein, as well as any of the additional or optional ingredients, components, steps, or limitations described herein. Herein, “mixtures” is meant to include a simple combination of materials and any compounds that may result from their combination. As used herein, “indicia” means an identifying mark, including text and/or graphics. As used herein, “image” means a photograph, illustration, and/or other pictorial representation of an object. Preferred embodiments of the hair conditioning composition of the present invention comprise a silicone polymer containing quaternary groups and a gel matrix. These compositions are prepared by a method comprising the step of mixing the silicone polymer containing quaternary groups with the gel matrix. Damaged hair is less hydrophobic compared to non-damaged and/or less damaged hair. It is believed that by providing improved hydrophobicity to hair, the hair conditioning composition can provide improved smooth feel and reduced friction to the hair. It is also believed that the improved hydrophobicity to the hair can be provided by some other preferred features of the present invention, for example, the use of additional materials such as silicones, and/or cationic surfactants. Further, without being limited to the theory, it is believed that improved hydrophobicity provides improved tolerance to the hair for humidity in the surrounding circumstances, and thus provides reduced frizziness and/or fly-aways on rainy and/or humid days. The hair conditioning composition of the present invention is preferably substantially free of anionic compounds. Anionic compounds herein include anionic surfactants and anionic polymers. In the present invention, “substantially free of anionic compounds” means that the composition contains 1% or less, preferably 0.5% or less, more preferably less than 0.01% of anionic compounds. The hair conditioning composition of the present invention has a pH of preferably from about 2 to about 9, more preferably from about 3 to about 7. The compositions of the present invention comprise a silicone polymer containing quaternary groups. The silicone polymer provides improved conditioning benefits such as smooth feel, reduced friction, prevention of hair damage. The silicone polymer is present in an amount of from about 0.1% to about 15%, preferably from about 0.25% to about 10%, more preferably from about 0.5% to about 5%, and even more preferably from about 2% to about 4% by weight of the composition. m is an integer 0 or greater, with the proviso that if m=0 then the A1 groups contain quaternary groups. Structures corresponding to the general formula, for example, are disclosed in U.S. Pat. No. 4,833,225, in U.S. Patent Application Publication No. 2004/0138400, and in U.S. Patent Application Publication No. 2004/0048996. n is an integer greater than about 200, preferably greater than about 250, more preferably greater than about 300; preferably less than about 700, more preferably less than about 500.
and n is an integer greater than about 200, preferably greater than about 250, more preferably greater than about 300; preferably less than about 700, more preferably less than about 500. E is a polyalkylene oxide group selected from the group consisting of —[CH2CH2O]q—[CH2CH(CH3)O]r—, and, —[OCH(CH3)CH2]r—[OCH2CH2]q—; wherein q is from about 1 to about 200; wherein r is from about 0 to about 200. The S groups can be the same or different if several S groups are present in the polysiloxane compound. R6 represents a monovalent or bivalent straight chain, cyclical or branched C1 to C20 hydrocarbon group which is interrupted by —O—, —NH—, —C(O)—, or —C(S)— and can be substituted with —OH or -A-E-R2 wherein A, E, and R2 are defined as in structure (IX) above. d) at least one organic or inorganic acid group for neutralization of the charges resulting from the ammonium groups. A− is an organic or inorganic anion (for example, the 2A− in the above structure can be laurate and acetate in a 1:1 mole ratio). The composition of the present invention comprises a gel matrix comprising a cationic surfactant, a high melting fatty compound, and an aqueous carrier. The cationic surfactant, together with the high melting fatty compound, and an aqueous carrier, provides a gel matrix which is suitable for providing various conditioning benefits, especially slippery and slick feel on wet hair. Thus, the silicone polymers containing quaternary groups (described above) and the gel matrix both provide conditioning benefits, such that when combined can impart increased functionality as compared to the individual components. In view of providing the above gel matrix, the cationic surfactant and the high melting point fatty compound are contained at a level such that the mole ratio of the cationic surfactant to the high melting point fatty compound is in the range of, preferably from about 1:1 to about 1:10, more preferably from about 1:2 to about 1:6 or from about 1:1 to about 1:4, in view of providing the above conditioning benefits especially slippery and slick feel on wet hair. Exemplary compositions of the present invention comprise, by weight of the composition, from about 60% to about 99%, preferably from about 70% to about 95%, and more preferably from about 80% to about 95% of a gel matrix including lamellar gel matrix, to which optional ingredients can be added (e.g., silicones). wherein one of R71, R72, R73, and R74 is selected from an aliphatic group of from about 16 to about 30 carbon atoms or an aromatic, alkoxy, polyoxyalkylene, alkylamido, hydroxyalkyl, aryl or alkylaryl group having up to about 30 carbon atoms; the remainder of R71, R72, R73, and R74 are independently selected from an aliphatic group of from about 1 to about 8 carbon atoms or an aromatic, alkoxy, polyoxyalkylene, alkylamido, hydroxyalkyl, aryl or alkylaryl group having up to about 8 carbon atoms; and X− is a salt-forming anion such as those selected from halogen, (e.g., chloride, bromide), acetate, citrate, lactate, glycolate, phosphate, nitrate, sulfonate, sulfate, alkylsulfate, glutamate, and alkyl sulfonate radicals. The aliphatic groups can contain, in addition to carbon and hydrogen atoms, ether linkages, and other groups such as amino groups. The longer chain aliphatic groups, e.g., those of about 16 carbons, or higher, can be saturated or unsaturated. Preferably, one of R71, R72, R73, and R74 is selected from an alkyl group of from about 16 to about 30 carbon atoms, more preferably from about 18 to about 26 carbon atoms, still more preferably from about 22 carbon atoms; the remainder of R71, R72, R73, and R74 are independently selected from the group consisting of CH3, C2H5, C2H4OH, CH2C6H5, and mixtures thereof; and (X) is selected from the group consisting of Cl, Br, CH3OSO3, and mixtures thereof. It is believed that such mono-long alkyl quaternized ammonium salts can provide improved slippery and slick feel on wet hair, compared to multi-long alkyl quaternized ammonium salts. It is also believed that mono-long alkyl quaternized ammonium salts can provide improved hydrophobicity and smooth feel on dry hair, compared to amine or amine salt cationic surfactants. Nonlimiting examples of such mono-long alkyl quaternized ammonium salt cationic surfactants include: behenyl trimethyl ammonium chloride available, for example, with tradename Genamine KDMP from Clariant, with tradename INCROQUAT TMC-80 from Croda and ECONOL TM22 from Sanyo Kasei; stearyl trimethyl ammonium chloride available, for example, with tradename CA-2450 from Nikko Chemicals; cetyl trimethyl ammonium chloride available, for example, with tradename CA-2350 from Nikko Chemicals; behenyltrimethylammonium methyl sulfate, available from FeiXiang; hydrogenated tallow alkyl trimethyl ammonium chloride; stearyl dimethyl benzyl ammonium chloride; and stearoyl amidopropyl dimethyl benzyl ammonium chloride. Among them, more preferred cationic surfactants are those having a longer alkyl group, i.e., C22 alkyl group. Such cationic surfactant includes, for example, behenyl trimethyl ammonium chloride and behenyltrimethylammonium methyl sulfate. It is believed that cationic surfactants having a longer alkyl group provide improved hydrophobicity on dry hair, compared to cationic surfactant having a shorter alkyl group. It is also believed that compared to cationic surfactants having a shorter alkyl group, cationic surfactants having a long alkyl group can provide improved hydrophobicity to the hair, especially to damaged hair, when combined with the polyol esters of the present invention. Alternatively, it is believed that cationic surfactant having an adequate length of alkyl group provides improved slippery and slick feel on wet hair, compared to a cationic surfactant having too long an alkyl group. Thus, it is believed that the selection of C22 alkyl group among long alkyl groups provides balanced benefits between improved hydrophobicity on dry hair and improved slippery and slick feel on wet hair. The compositions of the present invention preferably comprise the cationic surfactant in amount of from about 0.1% to about 10%, more preferably from about 1% to about 8%, still more preferably from about 1.5% to about 5% by weight of the composition. The hair conditioning composition of the present invention comprises a high melting point fatty compound. The high melting point fatty compounds useful herein have a melting point of about 25° C. or higher, and are selected from the group consisting of fatty alcohols, fatty acids, fatty alcohol derivatives, fatty acid derivatives, and mixtures thereof. It is understood by the artisan that the compounds disclosed in this section of the specification can in some instances fall into more than one classification, e.g., some fatty alcohol derivatives can also be classified as fatty acid derivatives. However, a given classification is not intended to be a limitation on that particular compound, but is done so for convenience of classification and nomenclature. Further, it is understood by the artisan that, depending on the number and position of double bonds, and length and position of the branches, certain compounds having certain required carbon atoms may have a melting point of less than about 25° C. Such compounds of low melting point are not intended to be included in this section. Nonlimiting examples of the high melting point compounds are found in International Cosmetic Ingredient Dictionary, Fifth Edition, 1993, and CTFA Cosmetic Ingredient Handbook, Second Edition, 1992. The high melting point fatty compound can be included in the composition at a level of from about 0.1% to about 20%, preferably from about 1% to about 10%, still more preferably from about 2% to about 8%, by weight of the composition. The fatty alcohols useful herein are those having from about 14 to about 30 carbon atoms, preferably from about 16 to about 22 carbon atoms. These fatty alcohols are saturated and can be straight or branched chain alcohols. Nonlimiting examples of fatty alcohols include cetyl alcohol, stearyl alcohol, behenyl alcohol, and mixtures thereof. The fatty acids useful herein are those having from about 10 to about 30 carbon atoms, preferably from about 12 to about 22 carbon atoms, and more preferably from about 16 to about 22 carbon atoms. These fatty acids are saturated and can be straight or branched chain acids. Also included are diacids, triacids, and other multiple acids which meet the requirements herein. Also included herein are salts of these fatty acids. Nonlimiting examples of fatty acids include lauric acid, palmitic acid, stearic acid, behenic acid, sebacic acid, and mixtures thereof. The fatty alcohol derivatives and fatty acid derivatives useful herein include alkyl ethers of fatty alcohols, alkoxylated fatty alcohols, alkyl ethers of alkoxylated fatty alcohols, esters of fatty alcohols, fatty acid esters of compounds having esterifiable hydroxy groups, hydroxy-substituted fatty acids, and mixtures thereof. Nonlimiting examples of fatty alcohol derivatives and fatty acid derivatives include materials such as methyl stearyl ether; the ceteth series of compounds such as ceteth-1 through ceteth-45, which are ethylene glycol ethers of cetyl alcohol, wherein the numeric designation indicates the number of ethylene glycol moieties present; the steareth series of compounds such as steareth-1 through steareth-10, which are ethylene glycol ethers of steareth alcohol, wherein the numeric designation indicates the number of ethylene glycol moieties present; ceteareth 1 through ceteareth-10, which are the ethylene glycol ethers of ceteareth alcohol, i.e., a mixture of fatty alcohols containing predominantly cetyl and stearyl alcohol, wherein the numeric designation indicates the number of ethylene glycol moieties present; C1-C30 alkyl ethers of the ceteth, steareth, and ceteareth compounds just described; polyoxyethylene ethers of behenyl alcohol; ethyl stearate, cetyl stearate, cetyl palmitate, stearyl stearate, myristyl myristate, polyoxyethylene cetyl ether stearate, polyoxyethylene stearyl ether stearate, polyoxyethylene lauryl ether stearate, ethyleneglycol monostearate, polyoxyethylene monostearate, polyoxyethylene distearate, propyleneglycol monostearate, propyleneglycol distearate, trimethylolpropane distearate, sorbitan stearate, polyglyceryl stearate, glyceryl monostearate, glyceryl distearate, glyceryl tristearate, and mixtures thereof. High melting point fatty compounds of a single compound of high purity are preferred. Single compounds of pure fatty alcohols selected from the group of pure cetyl alcohol, stearyl alcohol, and behenyl alcohol are highly preferred. By “pure” herein, what is meant is that the compound has a purity of at least about 90%, preferably at least about 95%. These single compounds of high purity provide good rinsability from the hair when the consumer rinses off the composition. Commercially available high melting point fatty compounds useful herein include: cetyl alcohol, stearyl alcohol, and behenyl alcohol having tradenames KONOL series available from Shin Nihon Rika (Osaka, Japan), and NAA series available from NOF (Tokyo, Japan); pure behenyl alcohol having tradename 1-DOCOSANOL available from WAKO (Osaka, Japan), various fatty acids having tradenames NEO-FAT available from Akzo (Chicago, Ill. USA), HYSTRENE available from Witco Corp. (Dublin, Ohio USA), and DERMA available from Vevy (Genova, Italy). The hair conditioning composition of the present invention comprises an aqueous carrier. The level and species of the carrier are selected according to the compatibility with other components, and other desired characteristics of the product. The carrier useful in the present invention includes water and water solutions of lower alkyl alcohols and polyhydric alcohols. The lower alkyl alcohols useful herein are monohydric alcohols having from about 1 to about 6 carbons, more preferably ethanol and isopropanol. The polyhydric alcohols useful herein include propylene glycol, hexylene glycol, glycerin, and propane diol. Preferably, the aqueous carrier is substantially water. Deionized water is preferably used. Water from natural sources including mineral cations can also be used, depending on the desired characteristic of the product. Generally, the compositions of the present invention comprise from about 20% to about 95%, preferably from about 30% to about 92%, and more preferably from about 50% to about 90% water. The composition of the present invention may include other additional components, which may be selected by the artisan according to the desired characteristics of the final product and which are suitable for rendering the composition more cosmetically or aesthetically acceptable or to provide them with additional usage benefits. Such other additional components generally are used individually at levels of from about 0.001% to about 10%, preferably up to about 5% by weight of the composition. A wide variety of other additional components can be formulated into the present compositions. These include: other conditioning agents such as hydrolysed collagen with tradename Peptein 2000 available from Hormel, water soluble and water insoluble vitamins such as vitamin A, D, B1, B2, B6, B12, C, biotin, vitamin E with tradename Emix-d available from Eisai, panthenol available from Roche, pantothenic acid, panthenyl ethyl ether available from Roche, and their derivatives; hydrolysed keratin, proteins, plant extracts, and nutrients; emollients such as PPG-3 myristyl ether with tradename Varonic APM available from Goldschmidt, Trimethyl pentanol hydroxyethyl ether, PPG-11 stearyl ether with tradename Varonic APS available from Goldschmidt, Stearyl heptanoate with tradename Tegosoft SH available from Goldschmidt, Lactil (mixture of Sodium lactate, Sodium PCA, Glycine, Fructose, Urea, Niacinamide, Glucosamine, Inositol, Sodium Benzoate, and Lactic acid) available from Goldschmidt, Sodium lactate, Sodium PCA, Glycine, Fructose, Urea, Niacinamide, Glucosamine, Inositol, Sodium Benzoate, Lactic acid, Ethyl hexyl palmitate with tradename Saracos available from Nishin Seiyu and with tradename Tegosoft OP available from Goldschmidt; hair-fixative polymers such as amphoteric fixative polymers, cationic fixative polymers, anionic fixative polymers, nonionic fixative polymers, and silicone grafted copolymers; preservatives such as benzyl alcohol, methyl paraben, propyl paraben and imidazolidinyl urea; pH adjusting agents, such as citric acid, sodium citrate, succinic acid, phosphoric acid, sodium hydroxide, sodium carbonate; salts, in general, such as potassium acetate and sodium chloride; coloring agents, such as any of the FD&C or D&C dyes, oxidative dyes and interference pigments; hair oxidizing (bleaching) agents, such as hydrogen peroxide, perborate and persulfate salts, carbonate; hair reducing agents such as the thioglycolates; perfumes; and sequestering agents, such as disodium ethylenediamine tetra-acetate; ultraviolet and infrared screening and absorbing agents such as octyl salicylate; antimicrobial agents; suspending agents; viscosity modifiers; nonvolatile solvents or diluents (water soluble and insoluble), pearlescent aids, foam boosters, additional surfactants or nonionic cosurfactants, pediculocides, chelants, skin active agents, sunscreens, UV absorbers, and, water soluble and insoluble amino acids such as asparagine, alanin, indole, glutamic acid, tyrosine, tryptamine, and their salts; and antidandruff agents such as zinc pyrithione, pyridinethione salts, azoles, climbazole, octopirox, salicylic acid, selenium sulfide, particulate sulfur, mixtures thereof. The composition of the present invention may further comprise a silicone compound, in addition to the silicone polymer containing quaternary groups. The silicone compound can be included in an amount of from about 0.1% to about 10%, more preferably from about 0.25% to about 8%, still more preferably from about 0.5% to about 3% by weight of the composition. The silicone compounds hereof can include volatile soluble or insoluble, or nonvolatile soluble or insoluble silicone conditioning agents. By soluble what is meant is that the silicone compound is miscible with the carrier of the composition so as to form part of the same phase. By insoluble what is meant is that the silicone forms a separate, discontinuous phase from the carrier, such as in the form of an emulsion or a suspension of droplets of the silicone. The silicone compounds herein may be made by conventional polymerization, or emulsion polymerization. The silicone compounds for use herein will preferably have a viscosity of from about 1,000 to about 2,000,000 centistokes at 25° C., more preferably from about 10,000 to about 1,800,000 centistokes, and even more preferably from about 25,000 to about 1,500,000 centistokes. The viscosity can be measured by means of a glass capillary viscometer as set forth in Dow Corning Corporate Test Method CTM0004, Jul. 20, 1970, which is incorporated by reference herein in its entirety. Silicone compounds of high molecular weight may be made by emulsion polymerization. Silicone compounds useful herein include polyalkyl polyaryl siloxanes, polyalkyleneoxide-modified siloxanes, silicone resins, amino-substituted siloxanes, and mixtures thereof. The silicone compound is preferably selected from the group consisting of polyalkyl polyaryl siloxanes, polyalkyleneoxide-modified siloxanes, silicone resins, and mixtures thereof, and more preferably from one or more polyalkyl polyaryl siloxanes. wherein R is alkyl or aryl, and x is an integer from about 7 to about 8,000. A represents groups which block the ends of the silicone chains. The alkyl or aryl groups substituted on the siloxane chain (R) or at the ends of the siloxane chains (A) can have any structure as long as the resulting silicone remains fluid at room temperature, is dispersible, is neither irritating, toxic nor otherwise harmful when applied to the hair, is compatible with the other components of the composition, is chemically stable under normal use and storage conditions, and is capable of being deposited on and conditions the hair. Suitable A groups include hydroxy, methyl, methoxy, ethoxy, propoxy, and aryloxy. The two R groups on the silicon atom may represent the same group or different groups. Preferably, the two R groups represent the same group. Suitable R groups include methyl, ethyl, propyl, phenyl, methylphenyl and phenylmethyl. The preferred silicone compounds are polydimethylsiloxane, polydiethylsiloxane, and polymethylphenylsiloxane. Polydimethylsiloxane, which is also known as dimethicone, is especially preferred. The polyalkylsiloxanes that can be used include, for example, polydimethylsiloxanes. These silicone compounds are available, for example, from the General Electric Company in their ViscasilR and SF 96 series, and from Dow Corning in their Dow Corning 200 series. Polymethylphenylsiloxanes, for example, from the General Electric Company as SF 1075 methyl phenyl fluid or from Dow Corning as 556 Cosmetic Grade Fluid, are useful herein. Also preferred, for enhancing the shine characteristics of hair, are highly arylated silicone compounds, such as highly phenylated polyethyl silicone having refractive index of about 1.46 or higher, especially about 1.52 or higher. When these high refractive index silicone compounds are used, they should be mixed with a spreading agent, such as a surfactant or a silicone resin, as described below to decrease the surface tension and enhance the film forming ability of the material. Another polyalkyl polyaryl siloxane that can be especially useful is a silicone gum. The term “silicone gum,” as used herein, means a polyorganosiloxane material having a viscosity at 25° C. of greater than or equal to 1,000,000 centistokes. It is recognized that the silicone gums described herein can also have some overlap with the above-disclosed silicone compounds. This overlap is not intended as a limitation on any of these materials. Silicone gums are described by Petrarch, and others including U.S. Pat. No. 4,152,416, to Spitzer et al., issued May 1, 1979 and Noll, Walter, Chemistry and Technology of Silicones, New York: Academic Press 1968. Also describing silicone gums are General Electric Silicone Rubber Product Data Sheets SE 30, SE 33, SE 54 and SE 76. All of these described references are incorporated herein by reference in their entirety. The “silicone gums” will typically have a mass molecular weight in excess of about 200,000, generally between about 200,000 and about 1,000,000. Specific examples include polydimethylsiloxane, poly(dimethylsiloxane methylvinylsiloxane) copolymer, poly(dimethylsiloxane diphenylsiloxane methylvinylsiloxane) copolymer and mixtures thereof. Polyalkyleneoxide-modified siloxanes useful herein include, for example, polypropylene oxide modified and polyethylene oxide modified polydimethylsiloxane. These materials are also known as dimethicone copolyols. Silicone resins, which are highly crosslinked polymeric siloxane systems, are useful herein. The crosslinking is introduced through the incorporation of tri-functional and tetra-functional silanes with mono-functional or di-functional, or both, silanes during manufacture of the silicone resin. As is well understood in the art, the degree of crosslinking that is required in order to result in a silicone resin will vary according to the specific silane units incorporated into the silicone resin. In general, silicone materials which have a sufficient level of trifunctional and tetrafunctional siloxane monomer units, and hence, a sufficient level of crosslinking, such that they dry down to a rigid, or hard, film are considered to be silicone resins. The ratio of oxygen atoms to silicon atoms is indicative of the level of crosslinking in a particular silicone material. Silicone materials which have at least about 1.1 oxygen atoms per silicon atom will generally be silicone resins herein. Preferably, the ratio of oxygen:silicon atoms is at least about 1.2:1.0. Silanes used in the manufacture of silicone resins include monomethyl-, dimethyl-, trimethyl-, monophenyl-, diphenyl-, methylphenyl-, monovinyl-, and methylvinylchlorosilanes, and tetrachlorosilane, with the methyl substituted silanes being most commonly utilized. Preferred resins are offered by GE Advanced Materials as GE SS4230 and SS4267. Commercially available silicone resins will generally be supplied in a dissolved form in a low viscosity volatile or nonvolatile silicone fluid. The silicone resins for use herein should be supplied and incorporated into the present compositions in such dissolved form, as will be readily apparent to those skilled in the art. Without being bound by theory, it is believed that the silicone resins can enhance deposition of other silicone compounds on the hair and can enhance the glossiness of hair with high refractive index volumes. Other useful silicone resins are silicone resin powders such as the material given the CTFA designation polymethylsilsequioxane, which is commercially available as Tospearl™ from GE Toshiba Silicones. Silicone resins can conveniently be identified according to a shorthand nomenclature system well known to those skilled in the art as the “MDTQ” nomenclature. Under this system, the silicone is described according to the presence of various siloxane monomer units which make up the silicone. Briefly, the symbol M denotes the mono-functional unit (CH3)3SiO0.5; D denotes the difunctional unit (CH3)2SiO; T denotes the trifunctional unit (CH3)SiO1.5; and Q denotes the quadri- or tetra-functional unit SiO2. Primes of the unit symbols, e.g., M′, D′, T′, and Q′ denote substituents other than methyl, and must be specifically defined for each occurrence. Typical alternate substituents include groups such as vinyl, phenyl, amino, hydroxyl, etc. The molar ratios of the various units, either in terms of subscripts to the symbols indicating the total number of each type of unit in the silicone, or an average thereof, or as specifically indicated ratios in combination with molecular weight, complete the description of the silicone material under the MDTQ system. Higher relative molar amounts of T, Q, T′ and/or Q′ to D, D′, M and/or or M′ in a silicone resin is indicative of higher levels of crosslinking. As discussed before, however, the overall level of crosslinking can also be indicated by the oxygen to silicon ratio. The silicone resins for use herein which are preferred are MQ, MT, MTQ, MQ and MDTQ resins. Thus, the preferred silicone substituent is methyl. Especially preferred are MQ resins wherein the M:Q ratio is from about 0.5:1.0 to about 1.5:1.0 and the average molecular weight of the resin is from about 1000 to about 10,000.
wherein R is CH3 or OH, x and y are integers which depend on the molecular weight, the average molecular weight preferably being approximately between 5,000 and 10,000; both a and b denote an integer from 2 to 8. This polymer is also known as “amodimethicone”. in which R2 is chosen from the group consisting of hydrogen, phenyl, benzyl, a saturated hydrocarbon radical, preferably an alkyl radical containing from 1 to 20 carbon atoms, and A− denotes a halide ion. Highly preferred amino silicones are those corresponding to formula (XVI) wherein m=0, a=1, q=3, G=methyl, n is preferably from about 1500 to about 1700, more preferably about 1600; and L is —N(CH3)2 or —NH2, more preferably —NH2. Another highly preferred amino silicones are those corresponding to formula (XVI) wherein m=0, a=1, q=3, G=methyl, n is preferably from about 400 to about 600, more preferably about 500; and L is —N(CH3)2 or —NH2, more preferably —NH2. Such highly preferred amino silicones can be called as terminal aminosilicones, as one or both ends of the silicone chain are terminated by nitrogen containing group. In this formula n and m are selected depending on the molecular weight of the compound desired; both a and b denote an integer from 2 to 8. In one embodiment of the present invention, the silicone compound is contained in the composition in the form of a silicone emulsion. The silicone emulsion herein is a predispersed stable emulsion comprising at least a surfactant, a silicone compound, and water. The surfactant useful herein is any known to the artisan. Silicone emulsions with a high internal phase viscosity are preferred. One preferred example is HMW2220 with an internal phase viscosity of greater than 120,000,000 centistokes, available from Dow Corning. Other modified silicones or silicone copolymers are also useful herein. Examples of these include silicone-based quaternary ammonium compounds (Kennan quats) disclosed in U.S. Pat. Nos. 6,607,717 and 6,482,969; end-terminal quaternary siloxanes disclosed in German Patent No. 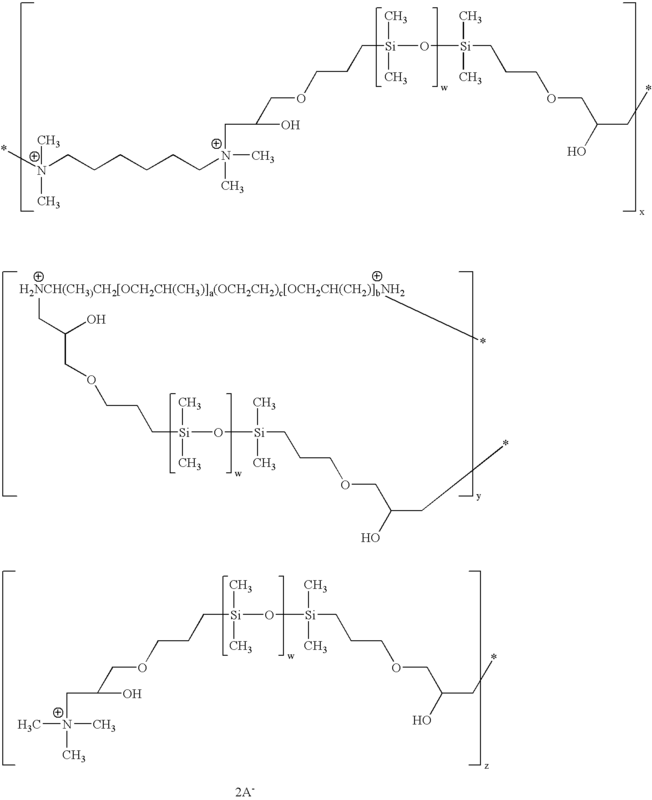 DE 10036533; silicone aminopolyalkyleneoxide block copolymers disclosed in U.S. Pat. Nos. 5,807,956 and 5,981,681; hydrophilic silicone emulsions disclosed in U.S. Pat. No. 6,207,782; and polymers made up of one or more crosslinked rake or comb silicone copolymer segments disclosed in WO2004/062634. In alternative embodiments of the present invention, the above-noted silicone-based quaternary ammonium compounds may be combined with the silicone polymers described in section A (entitled Silicone Polymer Containing Quaternary Groups) of the instant specification. The hair conditioning composition of the present invention may contain a polysorbate, in view of adjusting rheology. Preferred polysorbate useful herein includes, for example, polysorbate-20, polysorbate-21, polysorbate-40, polysorbate-60, and mixtures thereof. Highly preferred is polysorbate-20. The polysorbate can be contained in the composition at a level by weight of preferably from about 0.01% to about 5%, more preferably from about 0.05% to about 2%. Polypropylene glycol useful herein are those having a weight average molecular weight of from about 200 g/mol to about 100,000 g/mol, preferably from about 1,000 g/mol to about 60,000 g/mol. Without intending to be limited by theory, it is believed that the polypropylene glycol herein deposits onto, or is absorbed into hair to act as a moisturizer buffer, and/or provides one or more other desirable hair conditioning benefits. The polypropylene glycol useful herein may be either water-soluble, water-insoluble, or may have a limited solubility in water, depending upon the degree of polymerization and whether other moieties are attached thereto. The desired solubility of the polypropylene glycol in water will depend in large part upon the form (e.g., leave-on, or rinse-off form) of the hair care composition. For example, a rinse-off hair care composition, it is preferred that the polypropylene glycol herein has a solubility in water at about 25° C. of less than about 1 g/100 g water, more preferably a solubility in water of less than about 0.5 g/100 g water, and even more preferably a solubility in water of less than about 0.1 g/100 g water. The polypropylene glycol can be included in the hair conditioning composition of the present invention at a level of, preferably from about 0.01% to about 10%, more preferably from about 0.05% to about 6%, still more preferably from about 0.1% to about 3% by weight of the composition. Particularly useful pentaerythritol ester oils and trimethylol ester oils herein include pentaerythritol tetraisostearate, pentaerythritol tetraoleate, trimethylolpropane triisostearate, trimethylolpropane trioleate, and mixtures thereof. Such compounds are available from Kokyo Alcohol with tradenames KAKPTI, KAKTTI, and Shin-nihon Rika with tradenames PTO, ENUJERUBU TP3SO. Particularly useful citrate ester oils herein include triisocetyl citrate with tradename CITMOL 316 available from Bernel, triisostearyl citrate with tradename PELEMOL TISC available from Phoenix, and trioctyldodecyl citrate with tradename CITMOL 320 available from Bernel. Particularly useful glyceryl ester oils herein include triisostearin with tradename SUN ESPOL G-318 available from Taiyo Kagaku, triolein with tradename CITHROL GTO available from Croda Surfactants Ltd., trilinolein with tradename EFADERMA-F available from Vevy, or tradename EFA-GLYCERIDES from Brooks. Particularly useful poly α-olefin oils herein include polydecenes with tradenames PURESYN 6 having a number average molecular weight of about 500 and PURESYN 100 having a number average molecular weight of about 3000 and PURESYN 300 having a number average molecular weight of about 6000 available from Exxon Mobil Co.
Cationic polymers useful herein are those having a weight average molecular weight of at least about 5,000, typically from about 10,000 to about 10 million, preferably from about 100,000 to about 2 million. Polyethylene glycol can also be used as an additional component. The polyethylene glycols useful herein that are especially preferred are PEG-2M wherein n has an average value of about 2,000 (PEG-2M is also known as Polyox WSR® N-10 from Union Carbide and as PEG-2,000); PEG-5M wherein n has an average value of about 5,000 (PEG-5M is also known as Polyox WSR® N-35 and as Polyox WSR® N-80, both from Union Carbide and as PEG-5,000 and Polyethylene Glycol 300,000); PEG-7M wherein n has an average value of about 7,000 (PEG-7M is also known as Polyox WSR® N-750 from Union Carbide); PEG-9M wherein n has an average value of about 9,000 (PEG-9M is also known as Polyox WSR® N-3333 from Union Carbide); and PEG-14M wherein n has an average value of about 14,000 (PEG-14M is also known as Polyox WSR® N-3000 from Union Carbide). As used herein “n” refers to the number of ethylene oxide units in the polymer. Instrument: TA AR2000 or AR-G2 Rheometer, using the oscillation mode with a 40 mm diameter 2 degree AL cone and a gap of 57 μm. Sample Preparation: scoop samples with spatula, and put the sample onto the measurement table of the rheometer without scrambling to avoid generation of bubbles. Measurement Protocol: 1) equilibrate sample at a temperature of 26.7° C. for 4 minutes; 2) begin oscillation at a frequency step of from 0.1 Hz to 10 Hz with the oscillation fixed at 5.0 Pa and the temperature at 26.7° C. The loss modulus and storage modulus readings are recorded and available via the rheometer instrumentation. Exemplary silicone blends have tan δ values, as recorded at a frequency of 10 Hz and 26.7° C., from about 0.01 to about 5, preferably from about 0.05 to about 1, and more preferably from about 0.1 to about 0.5. Without being bound by theory, it is believed that the preferred tan δ value correlates to an in-use signal of end rinsing and/or clean feeling after rinsing, and consumers accordingly perceive compositions comprising these silicone blends to be superior in comparison to existing products. The silicone blends also have preferred viscosity values, including, for example, less than about 10,000,000 centistokes, less than about 1,000,000 centistokes, and less than about 500,000 centistokes. Viscosity can be measured using the rheometer and settings noted above, and using the shear stress controlled mode (0-20 Pa). Exemplary silicone blends include a combination of silicone polymers selected from those described in sections A and C of the instant specification (including, e.g., combinations that are devoid of the silicone polymers described in section A). The hair conditioning compositions of the present invention are used in conventional ways to provide conditioning and other benefits. Such method of use depends upon the type of composition employed but generally involves application of an effective amount of the product to the hair or scalp, which may then be rinsed from the hair or scalp (as in the case of hair rinses) or allowed to remain on the hair or scalp (as in the case of gels, lotions, creams, and sprays). “Effective amount” means an amount sufficient enough to provide a dry conditioning benefit. In general, from about 1 g to about 50 g is applied to the hair or scalp. The composition may be applied to wet or damp hair prior to drying of the hair. Typically, the composition is used after shampooing the hair. The composition is distributed throughout the hair or scalp, typically by rubbing or massaging the hair or scalp. After such compositions are applied to the hair, the hair is dried and styled in accordance with the preference of the user. In the alternative, the composition is applied to dry hair, and the hair is then combed or styled in accordance with the preference of the user. The hair conditioning compositions of the present invention can be in the form of rinse-off products or leave-on products, can be opaque, and can be formulated in a wide variety of product forms, including but not limited to creams, gels, emulsions, mousses and sprays. The compositions illustrated in the following examples exemplify specific embodiments of the compositions of the present invention, but are not intended to be limiting thereof. Other modifications can be undertaken by the skilled artisan without departing from the spirit and scope of this invention. The compositions illustrated in the following examples are prepared by conventional formulation and mixing methods, an example of which is described below. All exemplified amounts are listed as weight percents and exclude minor materials such as diluents, preservatives, color solutions, imagery ingredients, botanicals, and so forth, unless otherwise specified. The compositions of the present invention are suitable for rinse-off products and leave-on products, and are particularly useful for making products in the form of a rinse off conditioner. Deionized water q.s. q.s. q.s. q.s. q.s. q.s. q.s. *12 Cetyl alcohol: Konol series available from Shin Nihon Rika. *14 Polysorbate-20: Glycosperse L-20K available from Lonza Inc.
*22 Decyl glucoside: Plantacare 2000UP available from Cognis Japan Ltd.
Make the quaternary silicone polymers as disclosed in U.S. Pat. No. 4,833,225, in U.S. Patent Application Publication No. 2004/0138400, and in U.S. Patent Application Publication No. 2004/0048996. The quaternary silicone polymers can be added to the formulation as the neat material, as a preformed emulsion, or as a blend with a lower molecular weight material. In the latter case, the lower molecular weight materials can be any which can form a stable blend with the quaternary silicone polymer. Examples of low molecular weight materials include silicones such as decamethylcyclopentasiloxane, oxygen-containing solvents such as dipropyleneglycol-n-butylether, and silicone copolyols. Silicone copolyols are preferred. For the quaternary silicone polymer emulsion, the polymer is emulsified in the presence of an anionic, cationic, nonionic, or amphoteric surfactant, preferably a nonionic or cationic surfactant, by methods well known in the art. In examples containing the silicone quaternary polymer and a silicone copolyol, the two are mixed prior to addition to the product. Heat deionized water to 85° C. Mix cationic surfactants and high melting point fatty compounds into the water. Maintain the water at a temperature of about 85° C. until the components are homogenized and no solids are observed. Cool the mixture to about 55° C. and maintain at this temperature to form a gel matrix. Add the indicated quaternary silicone polymer to the gel matrix, either as the emulsion or as the blend with the copolyol. When included, add polyalphaolefin, polypropylene glycols, silicones, and/or polysorbates to the gel matrix. Maintain the gel matrix at about 50° C. during this time with constant stirring to assure homogenization. When included, add other additional components such as perfumes and preservatives at this point also. After homogenization, cool to room temperature. It should be understood that hair properties and actual/perceived benefits can vary from one individual to another, and therefore, the appended claims are not to be construed as limited to compositions providing all of the benefits that are described herein unless explicitly recited. 2. The hair conditioning composition of claim 1, wherein said silicone polymer is present in an amount of from about 0.1% to about 15% by weight of the composition. 3. The hair conditioning composition of claim 1, wherein said silicone polymer is present in an amount of from about 0.25% to about 10% by weight of the composition. 4. The hair conditioning composition of claim 1, wherein said silicone polymer is present in an amount of from about 0.5% to about 5% by weight of the composition. wherein when m is 2 or greater, each A2 independently can be the same or different. n is an integer greater than about 200. 7. The hair conditioning composition of claim 6, wherein said n is an integer of from about 300 to about 500. A− is an organic or inorganic anion. 9. The hair conditioning composition of claim 8, wherein said w is an integer from about 300 to about 500. 10. The hair conditioning composition of claim 1, wherein said cationic surfactant is present in an amount of from about 0.1% to about 10% by weight of the composition. 11. The hair conditioning composition of claim 1, wherein said silicone polymer is added to the formulation as a blend with a relatively lower molecular weight material, and wherein said relatively lower molecular weight material is selected from the group consisting of silicones, oxygen-containing solvents, and silicone copolyols. 12. A method of providing improved conditioning benefits to hair and/or skin, said method comprising the step of applying to said hair and/or skin the conditioning composition of claim 1. 14. The hair conditioning composition of claim 13, wherein said at least one additional silicone-based component comprises two components selected from said group consisting of silicone emulsions, amino silicones, silicone copolyols, and silicone-based quaternary ammonium compounds that are different from said silicone polymer containing quaternary groups. 15. The hair conditioning composition of claim 13, wherein said at least one additional silicone-based component comprises three components selected from said group consisting of silicone emulsions, amino silicones, silicone copolyols, and silicone-based quaternary ammonium compounds that are different from said silicone polymer containing quaternary groups. 16. The hair conditioning composition of claim 13, wherein said at least one additional silicone-based component comprises four components selected from said group consisting of silicone emulsions, amino silicones, silicone copolyols, and silicone-based quaternary ammonium compounds that are different from said silicone polymer containing quaternary groups. 18. The hair conditioning composition of claim 17, wherein said at least one additional silicone-based component comprises a silicone emulsion having an internal phase viscosity of greater than about 120,000,000 centistokes. 19. The hair conditioning composition of claim 18, wherein said at least one additional silicone-based component further comprises a silicone copolyol. 20. The hair conditioning composition of claim 19, wherein said at least one additional silicone-based component further comprises an amino silicone. in which R2 is selected from the group consisting of hydrogen, phenyl, benzyl, a saturated hydrocarbon radical, and an alkyl radical containing from 1 to 20 carbon atoms; and A− denotes a halide ion. 22. The hair conditioning composition of claim 17, wherein said at least one additional silicone-based component comprises an amino silicone. 24. The hair conditioning composition of claim 22, wherein said at least one additional silicone-based component further comprises a silicone copolyol. at least one of packaging for said hair conditioner and marketing material pertaining to said hair conditioner comprising indicia and/or an image providing a communication to consumers related to hair breakage, hair fall out or hair shed, and/or hair strength. wherein a combination of said first polymer and said second polymer have a tan δ value from about 0.01 to about 5. 28. The intermediate of claim 27, wherein said combination of said first silicone polymer and said second silicone polymer have a tan δ value from about 0.05 to about 1. 29. The intermediate of claim 27, wherein said combination of said first polymer and said second polymer have a tan δ value from about 0.1 to about 0.5. 30. The intermediate of claim 27, wherein said first polymer is a silicone polymer containing quaternary groups wherein said silicone polymer comprises silicone blocks with greater than about 200 siloxane units. 31. The intermediate of claim 27, wherein said combination of said first polymer and said second polymer has a viscosity of less than about 10,000,000 centistokes. 32. The intermediate of claim 27, wherein said combination of said first polymer and said second polymer has a viscosity of less than about 1,000,000 centistokes. 33. The intermediate of claim 27, wherein said combination of said first polymer and said second polymer has a viscosity of less than about 500,000 centistokes. 35. The hair conditioning composition of claim 34, wherein said intermediate has a viscosity of less than about 500,000 centistokes. MX2007015166A MX2007015166A (en) 2005-06-16 2006-06-12 Hair conditioning composition comprising silicone polymers containing quaternary groups.